Widescreen viewing, laser printing, scanning to PC -- the ALOS Z-Scan 47 is a powerful solution for microform viewing, scanning and distribution in the digital information era. And with a big 12 x 17 screen, you’ll be able to review more information in less time.  12 x 17 anti-glare screen lets you view wide originals or two-page spreads. Supports multiple film and fiche carriers to handle microfiche, jackets, aperture cards, 16mm and 35mm roll film, and 16mm film cartridges. 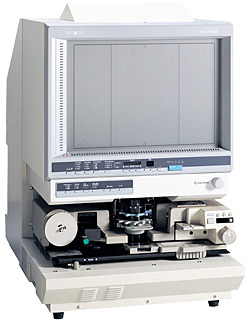  Auto imaging and image enhancement features adjust image position and alignment, zoom in on hard-to-read areas, enhance quality, trim and mask scan areas. Check stacking function lets you scan and print check front and back on a single sheet. Auto focusing capability with optional Auto Focus Kit.  Switch from PC scanning to laser printing at the touch of a front-panel button. High-resolution PC scanning to incorporate microform information in websites, Emails, faxes and desktop publishing.  Built-in USB-2 connector for PC interface, high-speed video connector for fast direct printing.  Laser printer and wide-format printer options give you print output to match the specific needs of your application. Two scanners can share a single printer, for greater cost-efficiency.